Have you ever been frustrated when someone calls the full house and you were nearly there? Well "Roll on Bingo" might just be the answer for you as the excitement carries on once the Full House has been called! Roll on Bingo gives a great new twist to the game of bingo and will hopefully leave more players happy. Normally the game is over when the 1 Line, 2 Lines and Full House has been called but with "Roll on Bingo" it continues and prizes will won by a number of other "Full House Calls". Obviously the prizes will tend to be smaller, but you will win something. Most sites have embraced this new promotion and we expect it to be around for good! Who Hosts Roll on Bingo games? New Customer Offer Only. 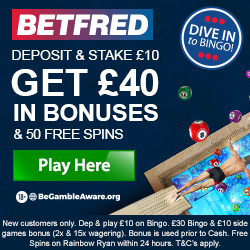 Deposit & play £10 on Bingo games within 30 days of joining. Get £25 paid as Slots Bonus (x20 wagering requirement) and £15 as Bingo bonus (x5 wagering requirement). 1 per customer. T&Cs apply. New customers only. Register with promo code BINGO90. Min deposit & stake £10 on Bingo Tickets to qualify. 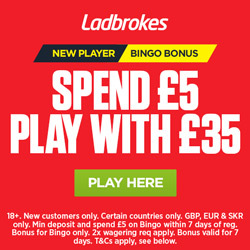 £30 Bingo Bonus must be wagered 2x prior to withdrawal. £10 Rainbow Riches Slot Bonus must be wagered 15x prior to withdrawal. Bonus expires after 14 days. Bonus Balance is used prior to Cash Balance. 50 Free Spins on Rainbow Ryan credited within 24 hours of qualification. Free Spins expiry after 7 days. T&Cs apply. Min dep: £10 on each deposit. 1st 3 deposits only. £10 cash staking on bingo required for £10 Bingo Bonus (4x wagering, 4x cap) and Games bonus and Rainbow Riches spins (50x wagering, 4x cap). T&Cs apply. New customers must deposit and spend £10 on mecca bingo within 60 days to receive £30 bingo bonus with 2x wagering requirement. T&Cs apply. 18+. New online customers only. Min 1st deposit and spend £10 within 30 days on bingo tickets only. 4x wagering reqs (bonus + winnings) apply. Bonus not withdrawable. Bonus valid for 7 days (bonus + winnings removed). £10 stake on selected games for The Chase Daily Quiz Game. Once per day. Max prize pool £1k. T&Cs apply.